April is National Poetry Month. For poetic inspiration and to nourish your muse, head to New England where Robert Frost and Emily Dickinson wrote. 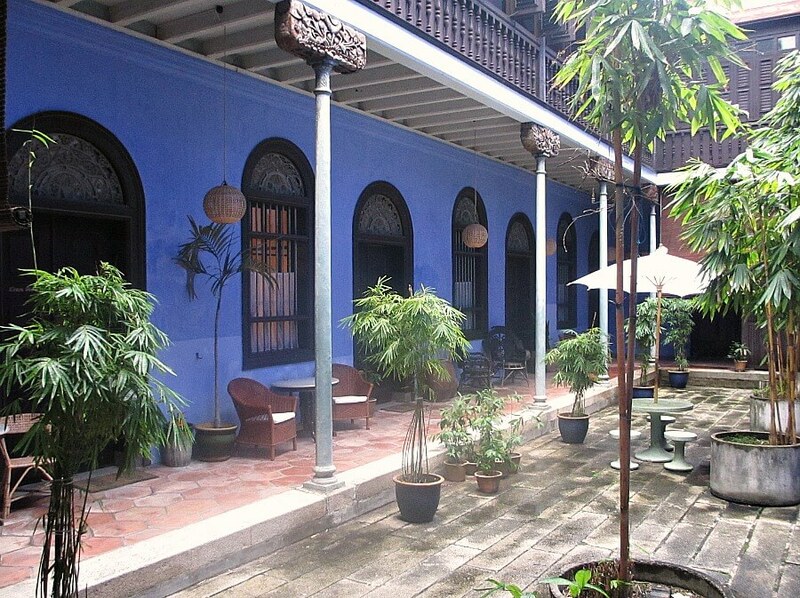 Each poet’s homes, now museums, have lodging close by. New England is a perfect start of a poetry inspired lodging journey. The house where Robert Frost wrote his iconic poem “Stopping by the Woods on a Snowy Evening” is now the Robert Frost Stone House and Museum in Shaftsbury, Vermont. 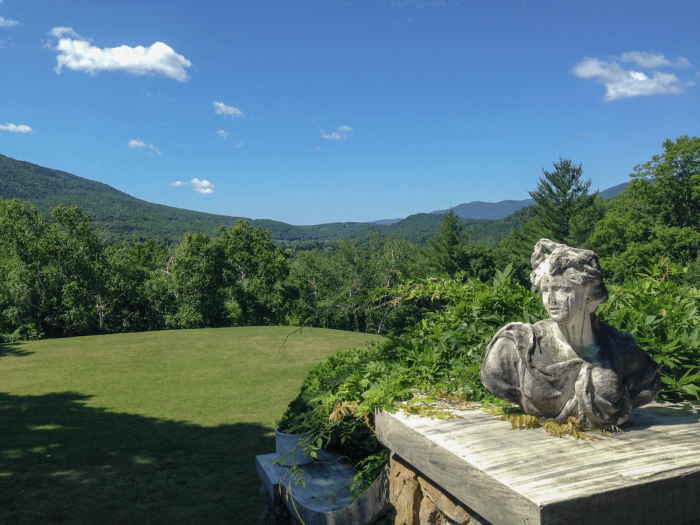 After visiting the museum, owned and operated by Bennington College, head to nearby Wilburton Inn in Manchester, Vermont. 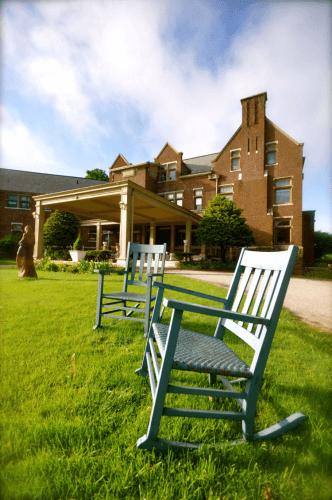 The Wilburton Inn, named by CNN as one of the top elegant mansion hotels in the U.S., has the Museum of the Creative Process on the 30-acre property. The museum’s focus is to bridge art and science to better understand the psychology of creativity. What better place to spend some time wordsmithing? There are several lodging options on the Wilburton Inn property from a stay in the 11 guest room mansion to a stay in one of the two villas to the Innkeepers Cottage. The mansion, built in 1902, is a mix of architectural influences including Arts and Crafts and European Tudor. Each guest room is unique with its own room configuration and bed type. Choose from one double bed to a king bed or two queen. Rooms have flat screen TVs and Wi-Fi. Antique furniture and oriental carpets throughout the mansion add to the elegant feel of this gorgeous property. The grounds of the Wilburton Inn are made to explore. There are walking paths, a tennis court, basketball court, outdoor swimming pool and sculptures at this kid-friendly, pet-friendly resort. In the morning, guests can enjoy the included full-country breakfast complete with fresh baked bread, pancake options, eggs, breakfast meats and more. Head to Franconia, New Hampshire for more Robert Frost Inspiration. The Frost Place Museum is housed in a small cottage where Robert Frost also lived and wrote. There is a nature trail here with Frost’s poems along the way. 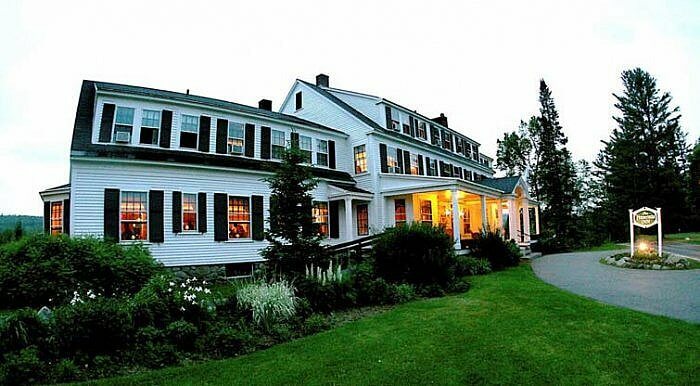 For lodging, the Franconia Inn with views of Mount Lafayette and the White Mountain Mountains offers activities from horseback riding to glider rides and x-country skiing depending on the season. 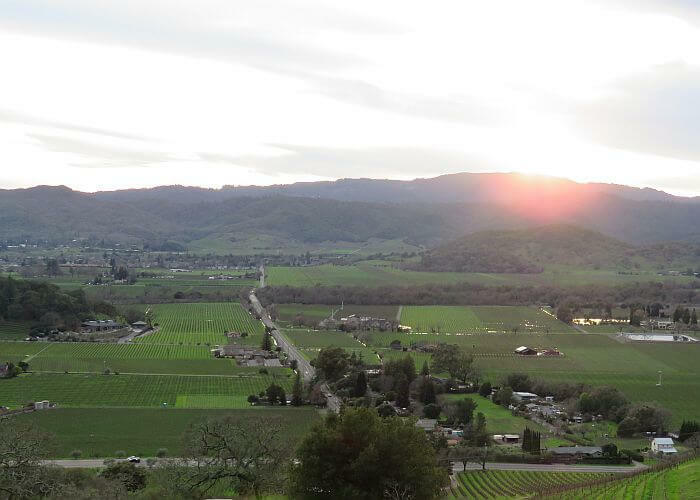 There are tennis courts, bike trails and an outdoor swimming pool. After a busy day, soak in the under the stars hot tub. 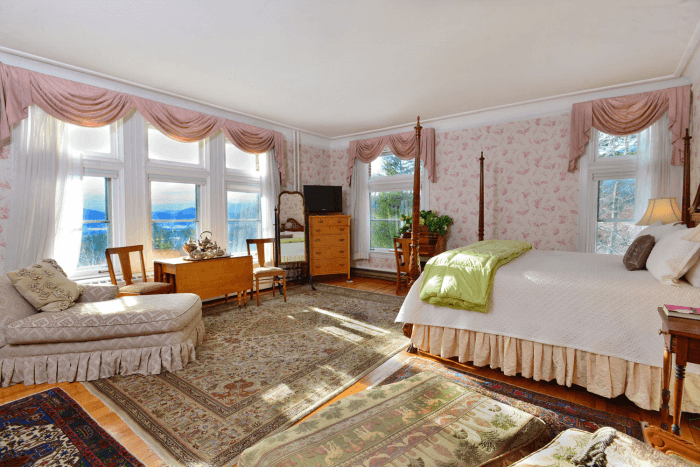 The Franconia Inn has been a respite for guests since 1863. These days, guests who stay in one of the 35 guest rooms enjoy a blend of elegance and country with large doses of comfort. Guest rooms range from “cozy” one double bed rooms to more spacious rooms that have a king to 2 double beds. Dine in the main dining room with its “Elegant American Cuisine,” or the Rathskeller Lounge with pub-style fare. Rates start at $136. Check out the package deals page. There are several from which to chose. You can also check rates on Hotels.com. 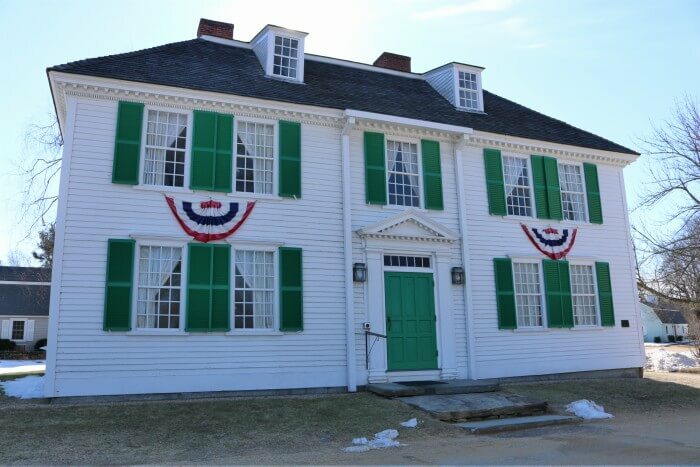 To celebrate Emily Dickinson, head to Amherst, Massachusetts to the Emily Dickinson Museum: The Homestead and the Evergreens. Dickinson, who was born in the Homestead house penned roughly 1800 poems. 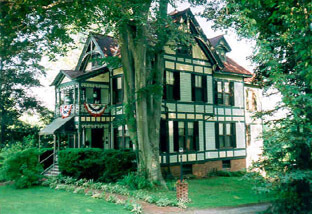 After a museum visit, head to either the Amherst Inn or the Allen House Inn. These companion inns offer guests full 5-course breakfasts, afternoon tea with refreshments, high speed internet, English toiletries, Swiss chocolate and the chance to relax in the midst of elegance. 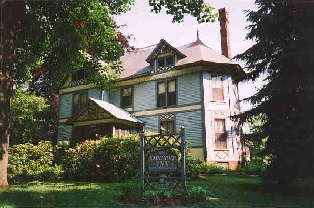 The Allen House Inn, a 1886 beauty, is an example of Victorian stick style architecture. The “Aesthetic Movement” of the Victorian Age’s influences are seen in the ornamentation of the décor and furnishings. 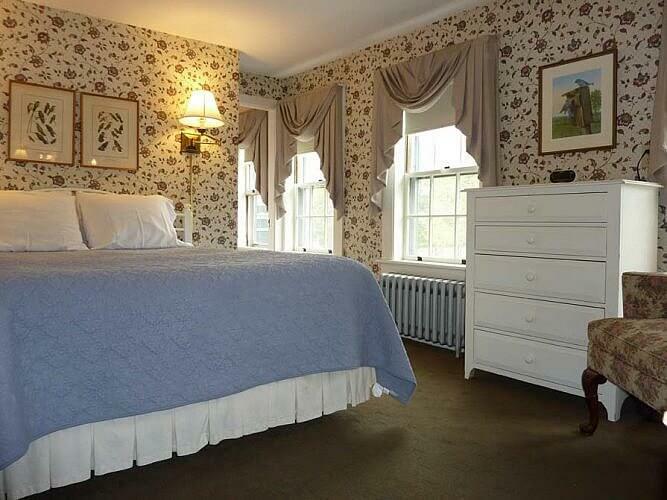 The six guest rooms of the Allen House Inn include rooms with one double bed, one queen bed, and one queen bed with two twin beds. You can book your stay through Trip Advisor. The 7 guestroom Amherst Inn has a similar mix of bed configurations. Each property allows for children over the age of 10. Room rates range from $75 to $195. You can book your stay at this inn through Trip Advisor as well. Post courtesy of Jamie Rhein. 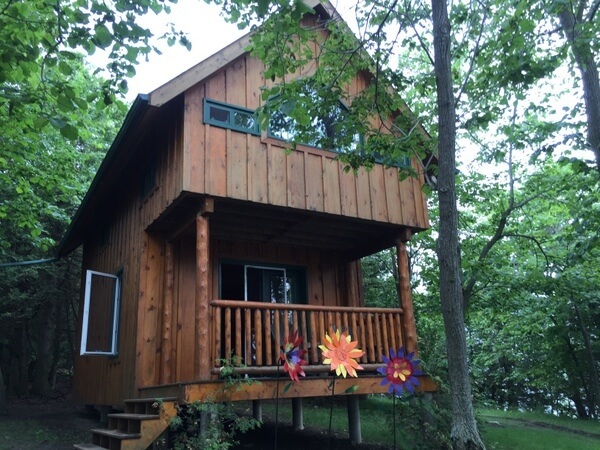 Photos courtesy of each property.